A huge thank you to all the members who donated items and those who came out to attend SOFAAR’s 2nd annual AGM and stash sale. It was a roaring success! We look forward to a busy and successful year. Reminder: The next issue of Snippets is coming up later this month. If you have any news that you think would be of interest to the SOFAAR membership – workshops, exhibitions, good books, websites, photos of your current or recently completed projects – anything at all that is fibre-related – please send them to info@sofaar.ca. We need your news! SOFAAR’s annual general meeting and Fibre Stash sale will take place on Saturday, March 17th 2018 at Saint-Luke’s Parish Hall in Annapolis Royal. The AGM will begin at 1:30 and last thirty minutes. The Stash sale and give-away will begin at 2 pm. If you are a SOFAAR member and would like to sell stash at this sale, tables are $10 each to rent. Please contact Christine at info@sofaar.ca to reserve a table. 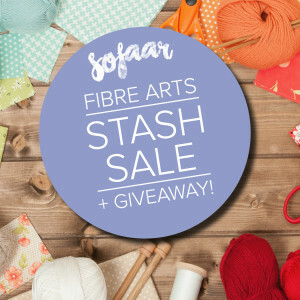 If you have stash you would like to give away, please also contact info@sofaar.ca. SOFAAR stash sale this Saturday! A reminder of the Fibre stash sale and give-away this Saturday, March 11th from 2 to 4 pm at Saint-Luke’s Hall in Annapolis Royal. Our AGM will take place at 1pm followed by this sale. Refreshments will be served. Bring a project along and spend the afternoon with other fibre enthusiasts. AGM and Stash sale next week! A reminder of SOFAAR’s AGM followed by a fibre stash sale and give-away and stitching afternoon next Saturday, March 11th. beginning at 1 pm. We’ve been sorting through stash and there are lots of interesting bits to be had from fabric to patterns to fibre to books and buttons and beads! Hope to see you there at St-Luke’s Parish Hall in Annapolis Royal. Stash sale starts at 2 pm and is open to the public so please let all your fibre friends know. Of course, the AGM is open to the public as well and begins at 1pm. We will be electing a new board and will tell you about all the exciting events coming up this year. SOFAAR’s first AGM held at St-Luke’s Parish Hall on March 14th was a great success. We would like to thank everyone for coming and showing their support for our new venture. We welcome 13 new members at SOFAAR including a new Life Member.